Belle maison au bord du lac une chambre avec accès au lac dans le quartier historique Alburgh, Vermont. Ce chalet d'une chambre peut accueillir deux adultes, le gîte est complet avec un lit queen et salle de bain complète. Après que vous avez apprécié le beau coucher de soleil depuis votre terrasse vous pourrez vous détendre dans le salon sur l'un des deux canapés confortables. Les clients auront accès à la cour commune, quai et de la plage. Si vous avez besoin de quoi que ce soit, soyez assuré que vos besoins seront satisfaits, car les propriétaires habitent sur place. Tom and Kathy’s cottage was exactly what we wanted. Breathtaking sunsets, gracious hospitality and spotless accomodations. Very close to the best frommagerie ever! Easy day trips for exploring. All you could want for as long as you can stay! Very nice. Host thought of everything. The cottage was very comfortable and laid out well. Watching the sunset from the chairs on the dock was a nightly ritual. Kayaking was fun. Tom and Kathy were the perfect hosts. 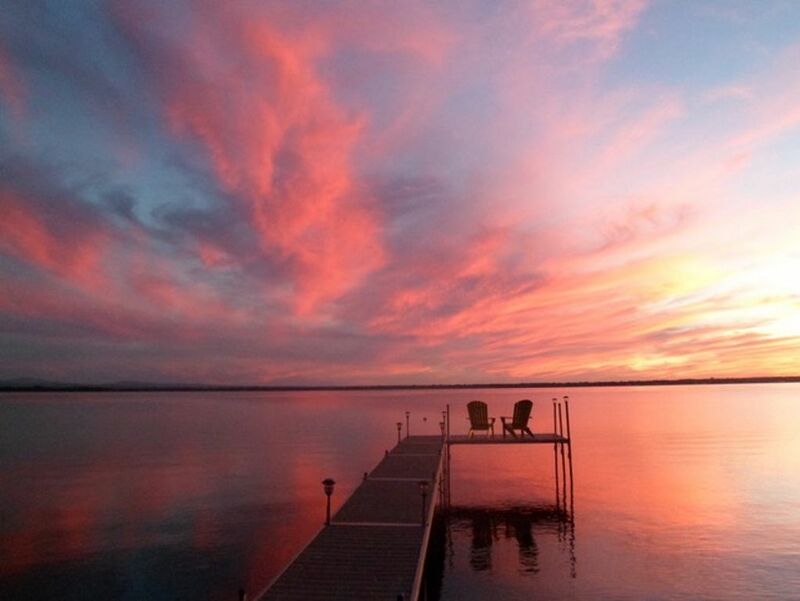 Stunning sunsets on beautiful Lake Champlain. Perfect for the laid back getaway we were needing. The cottage had all the amenities of home and the owners were always available if anything went wrong--like unseasonably warm weather that required the installation of an air conditioner before we arrived; locking our keys in the cottage; and a few other incidentals. Tom and Kathy were wonderful and as laid back as the atmosphere around the lake. We really enjoyed our stay at the Cottage. It was very comfortable, clean and well stocked. Eating on the deck looking out at the water was fabulous along with views of the sunset from the dock. If we had any questions or needed something Tom was on it immediately. We would love to return to the Lake Champlain area again and would stay at this cottage. Thanks Tom, you were the perfect host! Beautiful Lake! Great hosts! Only Memories! What can I say that others haven't already mentioned? Cottage was fully equipped. Tom was extremely responsive and super thoughtful prior to arrival and throughout our stay. We stayed from last Friday thru Monday and we could not have enjoyed and been more comfortable with our stay. The kitchen had everything possible. We cooked a few home cooked meals and ate on deck looking over Lake Champlain. Which is absolutely lovely! My husband fished off Tom's dock while I enjoyed a book from their bookshelf, on the porch swing. Tom was also kind enough to filet any fish caught off dock for us also. The smell in the air was so clean and the breezy days were absolute perfection. We enjoyed borrowing Tom's kayaks and venturing out on the lake along too. was there before we could press send on our email. The location was great too. An hour north of Burlington. Less than an hour to Montreal. Hour and half to Stowe. It was perfect. We had difficulty keeping Tv going without it cutting out but to be honest, we weren't there to watch tv when all you had to do was look out one of the many windows and look at beautiful Lake Champlain! Thank you Tom for everything! We had not felt that relaxed in a long time and it was a perfect few days that kicked off our vacation. You were an incredible host and made the stay care-free. Thank you! Great BabyMOON!!!! Thanks Jana and Steve. We enjoyed seeing have so much fun. Steve you're a natural fisherman!